[donotprint]Butter Substitute: My number one comfort meal is homemade soup, salad and fresh-baked bread with… well, it used to be butter, but no more. Since my first visit to Sage Kitchen in Phoenix, AZ where I ordered Moroccan Nomad Stew, served with toasted bread that was brushed with seasoned olive oil, I’ve changed my buttery ways. Such a simple thing, brushing bread with seasoned olive oil instead of butter, but I’d never thought of it. Maybe it’s a common practice in some tasty neck of the epicurean woods, but I hadn’t ever had bread prepared this way and I thought it was delicious. Using seasoned olive oil on bread is so easy. Honestly, I don’t usually measure when I make seasoned olive oil. I just drizzle olive oil in a dish and add seasonings. But here’s a link to a recipe for Seasoned Olive Oil that I use for my Portobello Mushroom Sandwich recipe. 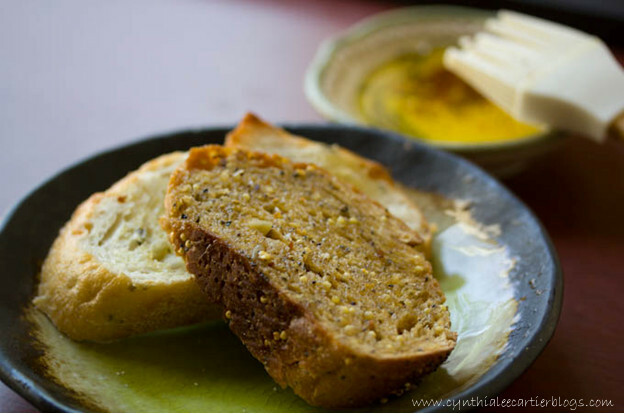 This recipe makes enough seasoned olive oil to brush 8 slices of bread. Measure olive oil in a small bowl. Add other ingredients and stir with pastry brush until mixed. Brush seasoned olive oil on toasted bread or on bread before baking. Link for Roasted Portobello Mushroom Sandwich that uses this recipe for Seasoned Olive Oil. Plant-Based Diet — Pizza Happens!